In English translations of Buddhist texts, householder denotes a variety of terms. Most broadly, it refers to any layperson, and most narrowly, to a wealthy and prestigious familial patriarch. In contemporary Buddhist communities, householder is often used synonymously with laity, or non-monastics. The Buddhist notion of householder is often contrasted with that of wandering ascetics (Pāḷi: samaṇa; Sanskrit: śramaṇa) and monastics (bhikkhu and bhikkhuni), who would not live (for extended periods) in a normal house and who would pursue freedom from attachments to houses and families. Upāsakas and upāsikās, also called śrāvakas and śrāvikās - are householders and other laypersons who take refuge in the Three Jewels (the Buddha, the teachings and the community) and practice the Five Precepts. In southeast Asian communities, lay disciples also give alms to monks on their daily rounds and observe weekly uposatha days. In Buddhist thought, the cultivation of ethical conduct and dāna or "almsgiving" will themselves refine consciousness to such a level that rebirth in one of the lower heavens is likely even if there is no further Buddhist practice. This level of attainment is viewed as a proper aim for laypersons. In some traditional Buddhist societies, such as in Burma and Thailand, people transition between householder and monk and back to householder with regularity and celebration as in the practice of shinbyu among the Bamar. One of the evolving features of Buddhism in the West is the increasing dissolution of the traditional distinction between monastics and laity. For all the diversity of Buddhist practices in the West, general trends in the recent transformations of Buddhist practice ... can be identified. These include an erosion of the distinction between professional and lay Buddhists; a decentralization of doctrinal authority; a diminished role for Buddhist monastics; an increasing spirit of egalitarianism; greater leadership roles for women; greater social activism; and, in many cases, an increasing emphasis on the psychological, as opposed to the purely religious, nature of practice. In the Pāli canon, householders received diverse advice from the Buddha and his disciples. Some householders who were also lay disciples were even identified as having achieved nibbana. Core householder practices include undertaking the Five Precepts and taking refuge in the Three Jewels. In addition, the canon nurtures the essential bond between householders and monastics still apparent today in southeast Asian communities. Who were these people in terms of class or profession? In the Canon, most of them evidently own land, but they usually have labourers to do the physical work. Sometimes they are also in business. In fact, they illustrate how it is in the first instance wealth derived from agriculture which provides business capital. The average gahapati who gave material support to the Buddha and his Sangha thus seems to have been something like a gentleman farmer, perhaps with a town house. On the other hand, inscriptions in the western Deccan, where Buddhism flourished in the early centuries CE, use the term gahapati to refer to urban merchants. We must distinguish between reference and meaning: the meaning of gahapati is simple and unvarying, but the reference shifts with the social context. Other people in the canon who are sometimes identified as "householders" in contemporary translations are simply those individuals who dwelt in a home or who had not renounced "home life" (Pali, agārasmā) for "homelessness" (Pali, anagāriya). a description of respectful actions for one's parents, teachers, spouse, friends, workers and religious guides. "One produces a deep thought of faith toward the Tathagata and is established in faith. He never lacks faith or is evil towards śramaṇas, brāhmaṇas, or deva, or māra, or brahmā. This is called the faith of an upāsaka." "Not to kill, not to steal, not to seduce, not to lie, and not to drink liquor, etc. This is called the morality of an upāsaka". "It is a rule (dharma) for an upāsaka that he should abandon stinginess. As for all living beings, without exception, stinginess, and envy are destroyed by him. Therefore, his mind should be devoid of stinginess and envy, and he should produce thoughts of liberality and personally donate, tirelessly. This is called 'possessed of liberality.'" "An upāsaka knows suffering according to reality, knows the collection of suffering according to reality, knows the extinction of suffering according to reality, and knows the path to the extinction of suffering according to reality. He understands with certainty. This is called 'possessed of wisdom.'" Other suttas in the canon likewise underline keeping the precepts, maintaining virtuous friends, homage to one's benefactors and earning one's wealth honestly. By providing alms to monks and nuns who are devoted to the attainment of nibbana. In the Digha Nikaya (III) the Buddha is said to have advised Sigala, a young man, that he should spend one fourth of his income on daily expenses, invest half in his business and put aside one fourth as insurance against an emergency. In the Pali canon, the pursuit of Nibbana (Skt: Nirvana) within this lifetime usually starts with giving up the householder life. This is due to the householder life's intrinsic attachments to a home, a spouse, children and the associated wealth necessary for maintaining the household. Thus, instead of advising householders to relinquish these and all attachments as a prerequisite for the complete liberation from samsara in this lifetime, the Buddha instructed householders on how to achieve "well-being and happiness" (hita-sukha) in this and future lives in a spiritually meaningful way. In Buddhism, a householder's spiritual path is often conceived of in terms of making merit (Pali: puñña). The primary bases for meritorious action in Buddhism are generosity (dāna), ethical conduct (sīla) and mental development (bhāvanā). Traditional Buddhist practices associated with such behaviors are summarized in the table below. Attaining the state of anāgāmi or "non-returner" is portrayed in the early texts as the ideal goal for laity. Anathapindika, is referenced for instance in AN 1.14.249 as "the householder Sudatta, the foremost lay devotee." Citta, referenced for instance in AN 1.14.250 as "the [foremost] householder for explaining the Teaching." In SN 17.23, Citta is one of two male lay disciples identified for emulation by the Buddha. Nakulapita and Nakulamata, referenced for instance in AN 1.14.257 and AN 1.14.266, respectively, as "the best confident" and the foremost "for undivided pleasantness." The Sigalovada Sutta has a parallel Chinese text. There are few differences between the Pali and Chinese versions. Further discussion of householder duties is found in the fourteenth chapter of the Sutra on Upasaka Precepts. The ngagpa (Wylie: sngags pa . feminine ngagma, Wylie: sngags ma ) is an ordained Tantric practitioner, sometimes a householder with certain vows (dependent upon lama and lineage) that make them the householder equivalent of a monk or nun. The path of a ngakpa is a rigorous discipline whereby one "enjoys the sense-fields' as a part of one's practice. A practitioner utilizes the whole of the phenomenal world as one's path. Marrying, raising children, working jobs, leisure, art, play etc. are all means to realize the enlightened state or rigpa, non-dual awareness. As such, we can see the prominence of householders in the Vajrayana tradition. One can, however, be a householder without taking the vows of a ngagpa. Simply holding the five precepts, bodhisattva vows and the tantric vows while practising diligently can result in enlightenment. Below common contemporary lay Buddhist practices are summarized. Some of these practices — such as taking Refuge and meditating — are common to all major schools. Other practices — such as taking the Eight Precepts or the Bodhisattva Vows — are not pan-Buddhist. Special day practices (Uposatha): practicing the Eight Precepts, studying Buddhist scriptures, visiting and supporting Buddhist monks, visiting and supporting Buddhist monasteries. Daily practices: Prostrations to the Triple Gem, taking refuge in the Triple Gem, taking the Five Precepts, chanting sutras and the names of buddhas/bodhisattvas, meditating, cultivating compassion and bodhichitta, recitation of mantras. ↑ In regards to the narrower definition of what today is often translated from the Pali Canon as "householder," see, for instance, the description of gṛhaspati in Nattier (2003), pp. 22-25. For more information, see Note 3 below. ↑ Stewart McFarlane in Peter Harvey, ed., Buddhism. Continuum, 2001, pages 195-196. ↑ In Buckley (2007), a BBC News article describing Burma's monks, the subheading includes: "...even those who do not choose to become a 'career monk' usually enter the orders for short periods of their lives...." In addition, the article's initial source is a BBC Burmese service professional who mentions that during his adult life he himself entered monastic life three times, each time for a few weeks. ↑ Alan Wallace (2002). Prebish, Charles S., ed. Westward dharma : Buddhism beyond Asia (PDF). Berkeley [u.a. ]: University of California Press. p. 35. ISBN 0-520-22625-9.
gahapati - "the possessor of a house, the head of the household, pater familias," often with a social status similar to high-ranking personages (Pali, khattiyā) and brahmins, suggesting comfort and wealth; may be used as a form of address comparable to "Sir." (PTS, 1921-25, p. 248, entry for gahapati.) See also Buddhadatta, 2002, p. 96, where "gaha-ttha" is defined as "a layman; householder" and "gaha-pati" is defined as "master of a house"; and, Nattier (2003), pp. 22-25, which provides contextual information to support its conclusion: "The word gṛhapati [Sanskrit for the Pali gahapati] is thus not an indicator of simple householder status but rather of significant social and financial standing, and it would have been applied only to a relatively limited segment of the lay Buddhist population." the Majjhima Nikaya (MN 51 to MN 60) (see Nanamoli & Bodhi, 2001, pp. 441-519). the Samyutta Nikaya (SN 12.41 to SN 12.50) (see Bodhi, 2000, pp. 578-86, and, in the Sinhalese Tipitaka, http://www.metta.lk/tipitaka/2Sutta-Pitaka/3Samyutta-Nikaya/Samyutta2/12-Abhisamaya-Samyutta/05-Gahapativaggo-e.html). the Anguttara Nikaya (AN 8.3) (see, in the Sinhalese Tipitaka, http://www.metta.lk/tipitaka/2Sutta-Pitaka/4Anguttara-Nikaya/Anguttara5/8-atthakanipata/003-gahapativaggo-e.html). ↑ See PTS (1921–25) entries for "Gahapati" (p. 248; retrieved 2008-02-16 at http://dsal.uchicago.edu/cgi-bin/philologic/getobject.pl?c.1:1:1150.pali) and "Seṭṭhi" (p. 722; retrieved 2008-02-16 at http://dsal.uchicago.edu/cgi-bin/philologic/getobject.pl?c.4:1:416.pali). ↑ DN 31 is translated in Narada (1996). ↑ This epithet is attributed to Buddhaghosa in Narada (1995) and is referenced in Bodhi (2005), p. 109; Hinüber (2000), p. 31; and Law (1932-33), p. 85, n. 1. ↑ PTS, p. 247, under the entry for "gaha (1)"
↑ See, for instance, the Dighajanu Sutta. ↑ For example, in DN 31, the Buddha addresses "Sigalaka the householder's son" (Bodhi, 2005, pp. 116-8). ↑ See, for instance, additional examples in Narada (1995) and in Bodhi (2005)'s chapter, "The Happiness Visible in this Present Life," pp. 107-142. ↑ For instance, the Rhinoceros Sutta (Snp 1.3) (Thanissaro, 1997) has the frequent cautionary refrain: "wander alone like a rhinoceros." ↑ Itivuttaka 4.8 (Thanissaro, 2001). Abbhokāso pabbajjā. Nayidaṃ sukaraṃ agāraṃ ajjhāvasatā ekantaparipuṇṇaṃ ekantaparisuddhaṃ saṃkhalikhitaṃ brahmacariyaṃ carituṃ. ↑ In an on-line English-language Sinhalese Tipitaka, these suttas are identified as AN 6.12.3 and 6.12.4 respectively, and are available at http://www.metta.lk/tipitaka/2Sutta-Pitaka/4Anguttara-Nikaya/Anguttara4/6-chakkanipata/012-samannavaggo-e.html. An on-line Pali-language version of these Sinhalese suttas, identified as AN 6.2.17 through 6.2.34 (with a separate verse for each gahapati), are available at http://www.metta.lk/tipitaka/2Sutta-Pitaka/4Anguttara-Nikaya/Anguttara4/6-chakkanipata/012-samannavaggo-p.html. In the PTS edition of the tipitaka, these passages are identified as A.iii, 450-51. ↑ Nyanaponika & Hecker (2003), p. 365, state that AN 6.120 refers to 21 "eminent lay disciples." The actual Pali text itself explicitly identifies 18 householders (gahapati) and three lay disciples (upasaka; see also, savaka); nonetheless, many of these identified householders are also identified as "foremost" (agga) lay disciples in AN 1.14. Tangentially, Bodhi (2005), p. 226, notes that a lay disciple is able to achieve the state of nonreturner but is not able to achieve arahantship unless upon death or, after realizing such, they immediately become monastics. ↑ See, for instance, Bodhi's translation of Samyutta Nikaya, chapter 43, where amata ("deathlessness" or "the deathless") and nibbana are synonyms (Bodhi, 2005, pp. 364-5). 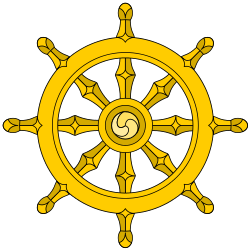 ↑ These first three objects of faith — the Buddha, the Dhamma and the Sangha — are known in Buddhism as the Three Jewels. In the Pali Canon, in general, sangha (without an explicit modifier or other contextual information) can refer to either the community of monks (see Sangha) or the community of noble disciples (see sravaka and arhat). The early teaching admitted that laypersons could attain the first three degrees of sainthood (stream-winner, once-returner, and non-returner); but whether they could become arhants was a disputed point. The Buddha reportedly declared that he took no categorical stand, that with the laity as with the monks it is conduct that counts. The Sūtras list twenty lay followers who attained the highest goal without ever becoming monks. Their case, though, is rarer than that of monks becoming arhants, and the household life is not considered propitious for the highest attainment. A famous passage at A.iii, 450-51 is often held to provide evidence for lay persons attaining arahantship and continuing to remain as householders, but such an interpretation is erroneous, based on mistaking the expression niṭṭhaṅgata to mean 'attained the goal,' when it actually means 'attained to certainty' and signifies a stream-enterer or one at some other grade of noble attainment short of arhatship. This statement is not found as such in the canonical texts, but the idea it expresses seems to be based on the few instances recorded in the Suttas of lay persons attaining arahantship. In such cases the lay person either immediately seeks admission into the Order, as in the case of Yasa (Vin.i,17) or is a householder on the verge of death, as in the case mentioned at S.V,410...."
↑ Sarah Shaw, author of Buddhist Meditation: An Anthology of Texts from the Pāli Canon. Routledge, 2006. [www.vesakday.net/vesak50/article/pdf_file/13_Buddhist_%20Meditation_Practices_West.pdf], page 8. ↑ In an on-line English-language Sinhalese Tipitaka, see http://www.metta.lk/tipitaka/2Sutta-Pitaka/4Anguttara-Nikaya/Anguttara1/1-ekanipata/014-Etadaggapali-e.html. Also see, Nyanaponika & Hecker (2003), pp. 337-62. ↑ In an on-line English-language Sinhalese Tipitaka, see http://www.metta.lk/tipitaka/2Sutta-Pitaka/4Anguttara-Nikaya/Anguttara1/1-ekanipata/014-Etadaggapali-e.html. Also see, Nyanaponika & Hecker (2003), pp. 365-72. "A faithful female lay follower, rightly imploring her only son, dear and beloved, might implore him thus: 'Dear, you should become like Citta the householder and Hatthaka of Alavaka — for this is the standard and criterion for my male disciples who are lay followers...."
↑ Also see AN 4.55 in Bodhi (2005), pp. 121-2, 433 n. 3. Note that, technically, Nakulapita is identified as the "householder" and, his spouse, Nakulamata as the "householder's wife." ↑ "Taisho Tripitaka Vol. 1, No. 1, Sutra 16 (佛說長阿含第二分善生經第十二)". ↑ "Taisho Tripitaka Vol. T24, No. 1488 (優婆塞戒經)". ↑ Kapleau (1989), p. 191. ↑ Daily chanting among Mahayana Buddhists can be found, for instance, among Nichiren and Pure Land practitioners. ↑ Examples in the Pali canon where the Buddha extols the practice of the Five Precepts included in the Dhammika Sutta and in the Sigalovada Sutta. ↑ In the Mahaparinibbana Sutta, the Buddha states that devotees can do pilgrimages to his birthplace, the place of his awakening, the place of his first teaching and the place of his death. Other sites have also been traditionally recognized by Theravada practitioners. Bodhi, Bhikkhu (ed.) (2005), In the Buddha's Words: An Anthology of Discourses from the Pali Canon. Somerville, MA: Wisdom Publications. ISBN 0-86171-491-1. Buckley, Sarah (26 Sept 2007). "Who are Burma's monks?" Retrieved 26 Sep 2007 from "BBC News" at http://news.bbc.co.uk/2/hi/asia-pacific/7014173.stm. Buddhadatta Mahathera, A. P. (2002). Concise Pali-English Dictionary. Delhi:Motilal Banarsidass. ISBN 81-208-0605-0. Gombrich, Richard (2002). Theravāda Buddhism: A Social History from Ancient Benares to Modern Colombo. London: Routledge. ISBN 0-415-07585-8. Hinüber, Oskar von (2000). A Handbook on Pāli Literature. Berlin: de Gruyter. ISBN 3-11-016738-7. Ireland, John D. (trans.) (1983). Sn 2.14, Dhammika Sutta: Dhammika (excerpt). Available on-line at http://www.accesstoinsight.org/tipitaka/kn/snp/snp.2.14.irel.html. Kapleau, Philip (1989). Zen: Merging of East and West. NY:Anchor Book. ISBN 0-385-26104-7. Law, Bimala Churn (1932–33), "Nirvana and Buddhist Laymen" in the Annals of the Bhandarkar Oriental Research Institute, Vol. 14, 1932–1933, pp. 80–86. Available on-line at: http://ccbs.ntu.edu.tw/FULLTEXT/JR-ENG/lawn.htm. Narada Thera (1995). Everyman's Ethics: Four Discourses of the Buddha. Available on-line at: http://www.accesstoinsight.org/lib/authors/narada/wheel014.html. Narada Thera (trans.) (1996). DN 31, Sigalovada Sutta: The Discourse to Sigala, The Layperson's Code of Discipline. Available on-line at: http://www.accesstoinsight.org/tipitaka/dn/dn.31.0.nara.html. Nyanaponika Thera & Hellmuth Hecker, Bhikkhu Bodhi (ed.) (2003). Great Disciples of the Buddha: Their Lives, their Works, their Legacy. Somerville, MA:Wisdom Publications. ISBN 0-86171-381-8. Pali Text Society (PTS) (1921–1925). The Pali Text Society's Pali-English Dictionary. Chipstead: Pali Text Society. Available on-line at: http://dsal.uchicago.edu/dictionaries/pali/. Thanissaro Bhikkhu (trans.) (1996). Muni Sutta: The Sage (Sn 1.12). Available on-line at: http://www.accesstoinsight.org/tipitaka/kn/snp/snp.1.12.than.html. Thanissaro Bhikkhu (trans.) (1997). Khaggavisana Sutta: A Rhinoceros Horn (Sn 1.3). Available on-line at: http://www.accesstoinsight.org/canon/sutta/khuddaka/suttanipata/snp1-03.html. Thanissaro Bhikkhu (trans.) (2001). The Group of Fours. (Iti. 100-112). Available on-line at http://www.accesstoinsight.org/tipitaka/kn/iti/iti.4.100-112.than.html. Itivuttaka 4.8 is available at http://www.accesstoinsight.org/tipitaka/kn/iti/iti.4.100-112.than.html#iti-107. Wallace, Alan (2002). "The Spectrum of Buddhist Practice in the West" in Charles Prebish & Martin Baumann (eds. ), Westward Dharma: Buddhism Beyond Asia. Berkeley:University of California Press. ISBN 0-520-22625-9. Also available on-line at: http://www.alanwallace.org/The%20Spectrum%20of%20Buddhist%20Practice.pdf. "Gahapati" and "Gaha-ttha" - two PTS Pali-English Dictionary (PED) entries related to "householder." "A Seamless Process: Practice On and Off the Cushion", an IMS interview with Kamala Masters & Steve Armstrong.